For a long time the tech world has been talking about the upcoming Nokia Lumia EOS, but after news over recent days it now seems almost certain that it will be released as the Nokia Lumia 1020. At the weekend we shared some release and price news about this smartphone, and today a leaked image of a Nokia Lumia 1020 (EOS) case and charging accessory has emerged. The major focus of the Nokia Lumia 1020 is its 41-megapixel camera, and many people are avidly waiting for the phone to be unveiled at an event on July 11. In our recent price and release news we told how it’s now expected to release in late July or early August, although we should point out that this is not yet confirmed. In the same article we also showed readers a leaked image purporting to be the back of the Lumia 1020. 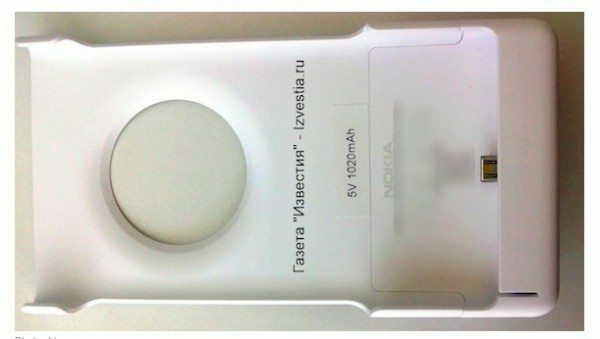 Now another image has emerged, and this time it claims to be of a Lumia 1020 case and charger accessory. The picture that you can see below apparently shows a charging shell for the device. The accessory will enable users to give their phone more charge while it’s still in use and the photo shows the camera opening and also an extra battery capacity of 1020 mAh. This may not seem to offer much of an extra charge and usually these kinds of accessories come from third-party makers and have a higher capacity. However, they usually add much more bulk than the accessory pictured here would seem to, so if this is the real deal then it could be very useful. We’d like to hear your thoughts on the Nokia Lumia 1020 aka EOS, and of course the case and charging accessory in this leaked image. Are you waiting for the phone to be officially unveiled? Do you think you would also be interested in purchasing this accessory if it’s genuine? Let us know with your comments.